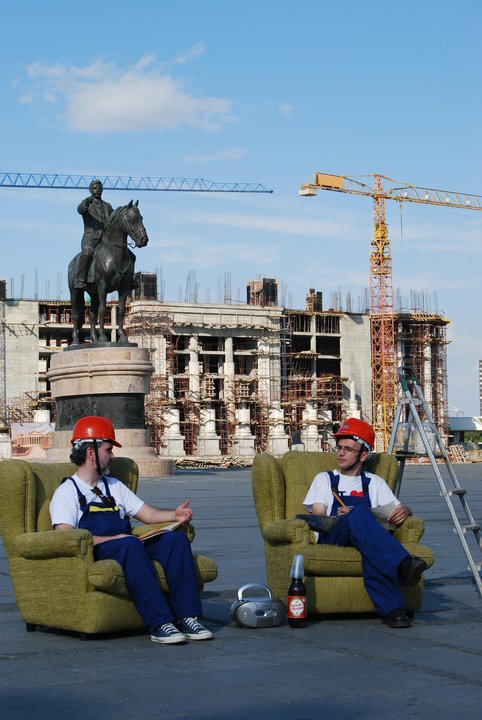 Straight from artist Zoran Poposki's living room, and co-produced by curator Goran Gjorgievski, comes the latest performance in urban public space in Skopje, entitled "Portrait of the Artist as a Cultural Worker". In this performative tryptich (composed of the performances "Thesis", "Sweet Movie", and "Working Class Hero"), Poposki reflects on the nature of immaterial artistic labor as paradigmatic in the post-fordist economy, as well as on his own artistic practice focused almost exclusively on public space as a place for representation and discursive action. Poposki's performance is realized as part of "Curatorial Workshop", a project by Goran Gjorgievski, curator at the National Gallery of Macedonia - Mala Stanica. Curatorial Workshop is conceived as a project where the curator is photographed with the artist in the context of his/her work. Portrait of the artist as a cultural worker from zoran poposki on Vimeo.